McEwen Mining Inc. [MUX-TSX; NYSE] is putting the emphasis on exploration and innovation as it bids to grow its gold production and extend the life at key operations in North America and Argentina. During an investor day conference on September 6, 2018, McEwen officials also said the company hopes to make an “investment decision” within two years at the Los Azules property in Argentina, which it has described as one of the world’s largest undeveloped copper projects. Having seen its stock price fall from $3.25 in late July 2018, to $2.62 on September 12, 2018, McEwen aims to qualify for inclusion in the S&P 500 Index by creating a profitable gold and silver producer with a focus on the Americas, including the U.S., Canada, Mexico and Argentina. Its key assets are the San Jose mine in Santa Cruz, Argentina, the Black Fox mine in Timmins, Ontario, the El Gallo Fenix project in Mexico, the Gold Bar mine in Nevada (currently under construction), and the Los Azules copper project. Robert McEwen, Executive Chairman and Chief Owner, McEwen Mining Inc., the Bay Street financier who owns 24% of McEwen Mining, has said he hopes to see the company increase its production from around 170,000-185,000 ounces this year to at least 220,000 ounces by 2020. Due to its location in the heart of Nevada’s Cortez Trend, the company has high hopes for the Gold Bar Mine, which is expected to produce 55,000 ounces of gold next year, increasing to 60,000 ounces in 2020. The initial gold pour at the heap leach operation is scheduled for the first quarter of 2019. 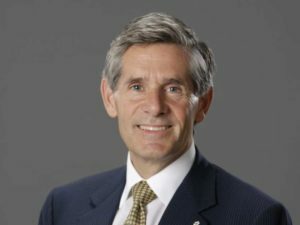 The company recently started a new phase of drilling as part of a $5 million exploration program after announcing a resource update featuring an increase of 92,000 ounces of indicated resources and an additional 82,000 ounces of inferred resources mainly in areas known as Gold Pick and Gold Ridge. Measured and indicated resources at Gold Bar now stand at 721,000 ounces. On top of that is 197,000 ounces of inferred material. The Gold Bar South property, consisting of 109 mining claims and located 5 km from Gold Bar, contains an indicated resource of 101,000 ounces gold and 5,000 ounces of inferred material. The company hopes to extend the life of the mine beyond the current seven-year estimate by drilling four high priority targets under existing and former open pits and exploring for deeper Carlin-type gold discoveries at the site. McEwen senior vice-president Sylvain Guerard said this effort has been delayed by a lengthy permitting process. “We believe Gold Bar hosts all the essential attributes that are characteristic to large Carlin-type gold deposits and look forward to this new and exciting phase of exploration,” Guerard said. In keeping with its expansion plan, McEwen agreed last year to acquire the Black Fox Complex near Timmins, Ontario from Primero Mining Corp. for $35 million. The acquisition was expected to add about 50,000 ounces of gold production to McEwen’s portfolio in 2018. At the time of the acquisition, McEwen said excess mill and tailings capacity at Black Fox should allow for an increase in production from known deposits as well as from new discoveries. The Black Fox Complex is located along a 7-km section of the fabled Destor Porcupine Fault, a geological formation, also known as the Golden Highway, which hosts many world class gold deposits. The Black Fox Mine is a key component of the complex, which also includes the Black Fox-Stock mill. The complex is estimated to contain an indicated resource of 1.34 million ounces of gold in four deposits (Black Fox, Froome, Tamarack and Grey Fox) of which Tamarack is the largest. Located about 500 metres east of main production ramp, Tamarack is estimated to host 127,000 ounces of grade 5.08 g/t gold equivalent. The open pit and underground operations at the Black Fox Mine have produced 835,000 ounces of gold to date. On September 6, 2018, McEwen said it is encouraged by results from an ongoing $15 million exploration program at the Black Fox Complex. The company said the estimated indicated resource at Froome has increased by 14% from an earlier estimate to 181,000 ounces gold at a grade of 5.09 g/t. At the same time, McEwen announced an initial inferred resource of 114,000 ounces of 2.54 g/t for the Stock East deposit. Stock East is located on a 2-km long mineralized trend that also hosts the former underground Stock Mine. Part of the Black Fox Complex, the Stock Mine 137,000 ounces of gold from an underground operation between 1989 and 2005. An infill drill program is ongoing with the objective of upgrading the inferred resource to the indicated category later in 2018, the company said in a press release. Aside from the gold assets, McEwen is also working to develop its 100%-owned Los Azules copper-gold-silver project in the San Juan region of Argentina. The company released a Preliminary Economic Assessment in September 2017. It was envisioned that the mine has the potential to produce upwards of 150,000 tonnes per year of copper and 40,000 ounces of gold with an initial capital expenditure of US$2.4 billion. The projected mine life is estimated at 38 years. Political and fiscal conditions in Argentina remain fluid. As a result, infrastructure requirements are unlikely to be met in the near term. Goldman Sachs noted that the area is remote and there is no infrastructure nearby. “There are no nearby towns, indigenous residents or settlements, which makes the project development a bit difficult,” Goldman said in its evaluation. However, McEwen has selected a site for the airstrip, as well as alternative road access, and a powerline access route, which would follow the road. The company said it hopes to receive an environmental permit for exploitation by the fourth quarter 2019. Logistics through Chile have also been defined. The company hopes to be in a position to make an investment decision at Los Azules by 2020. In Mexico, the company hopes to add 12 years of mine life at its El Gallo Complex in Sinaloa State through a proposed redevelopment program known as Project Fenix. It hopes to achieve that goal by combining mineralized sources from five locations that will be developed in two distinct process plant construction phases. Phase 1 would target the recovery of heap leach material using a conventional ball mill, grinding and hybrid-carbon-in-leach circuit. In Phase 2, the processing facility would be modified to allow for treatment of the El Gallo Silver deposit, followed by material from other deposits in the project area. The key outcome is expected to be an average annual production rate of 47,000 ounces of gold equivalent.